Recent research has indicated that white flour and added sugar are not good for us, and for a lot of reasons. (Eggs, by contrast, have seen a return to respectability after the cholesterol scares of the last century.) Nevertheless, there are times when time is our enemy, and eating breakfast is important. Aldi carries cereal, of course, but they also carry a few other quick breakfast foods, including cereal bars and granola. Millville Toaster Tarts come in a few flavors, including frosted strawberry, cinnamon, chocolate, and s’mores. We typically see them in boxes of twelve, and often for less money than a Pop Tart box of six. The box claims that the toaster tarts are a “good source of vitamins and minerals” with “0g trans fat” and “no cholesterol.” The vitamin-mineral claim is a bit of a stretch, as the tarts only average about 10% in key areas, so we wouldn’t suggest relying on these for your nutrition needs. The other parts are technically true, although the tarts are high in saturated fat and sodium. They also have a rather high 200 calories per tart, or 400 per foil pack. The tarts, being made of white flour, aren’t terribly filling. Most people familiar with Pop Tarts and the like don’t need instructions on how to eat them, but the box gives some anyway. They can be toasted for a bit or microwaved for three seconds, or they can simply be eaten cold right out of the box if that’s your preference. Be advised to keep a close eye on the tarts if you use a toaster; although we think this is the best way to prepare them, it’s easy to burn them if you’re not paying close attention … and a burned toaster tart is not tasty. 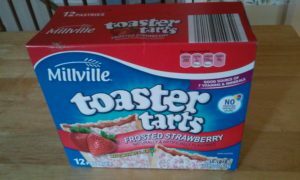 We think Millville Toaster Tarts taste about as good as a toaster tart can without being a Pop Tart. The flavor is good — much better, we think, than other generic tarts. A real Pop Tart has a slightly richer flavor — and comes in a larger array of flavors — but Aldi tarts are very competitive. The fact that they’re a lot cheaper than Pop Tarts is no small consideration, either. If you’re trying to eat a healthy breakfast, this isn’t it: it’s loaded with white flour, sugar, and a lot more calories than you might think. If, however, you’re looking for a suitable substitute for brand-name Pop Tarts, these are quite competent, especially for the price. Aldi also carries brand-name Pop Tarts, too, if it’s really important to you.